History of Java's traditional medicine store a variety of stories. Many types of herbs that were born from the creativity or trial and error. Wedang uwuh that are popular now that many are just one of them. Although that is rubbish, this wedang refreshes and nourish the body. Taste is so unique. There are many kinds of beverages in a healthy tradition of Javanese society. There wedang ginger, wedang round, wedang cup, and so forth. Savor the drink, in addition to warm the body, some are able to relieve cough and increase endurance. Which is now in vogue many people, especially people living in the area Imogiri, Bantul, Yogyakarta and surrounding areas are wedang uwuh. Wedang popularity has penetrated, it is also the capital city and several other major cities in Indonesia. Not a few people who brought gifts wedang uwuh ready brewed, after a trip to Yogyakarta. Perhaps you also have to taste it. Uwuh in Javanese means to rubbish. Dubbed uwuh because residues or materials when it is mixed with the drink seem like useless junk. Various types of herbs to browse content wedang uwuh include ginger, wood shavings cup Wit, shavings of cinnamon, cloves, nutmeg leaves. Sometimes added also stems lemongrass or lime leaves. It could also be affixed with rock sugar or brown sugar. Glimpsed from basic ingredients, do not be surprised if wedang uwuh have health benefits. From the start of ginger, a rhizome which is more than just herbs. Ginger has been known potent repel a variety of complaints. Its useful as heat warmers. More than that, ginger, through much research, proved beneficial for blood circulation. Ginger is an anticoagulant (blood antipembekuan) is greater than that of garlic or onion. Ginger is also able to lower cholesterol because it can reduce the absorption of cholesterol in the blood and liver. The study, conducted by experts in Japanese show, ginger can lower high blood pressure by reducing peripheral blood flow rate (peripheral blood flow). Cinnamon has antioxidant properties and make sense of wedang is much more enjoyable. Many herbalists believe that the mixture of ginger and cinnamon are believed to increase endurance because of the high antioxidant content. Rich in AntioxidantsDr Michael from Herbacure rate, the various ingredients in wedang uwuh if the described one by one does have various benefits. Especially those benefits to boost immunity and increase blood flow. 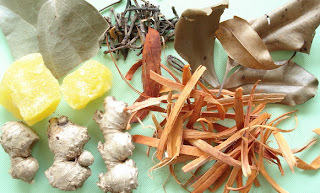 Shavings of cinnamon and clove, makes clear, is a herb that is warm, can also provide aroma as well as a unique taste sensation. Nutmeg leaves contain saponins, polyphenols, and flavonoids beneficial for pain relief, relieve stomach pains due to colds, blood circulation, and solve problems in the stomach. Another important component in wedang uwuh is a cup. Herb commonly called cup wood (Caesalpinia sappan) has long been known as a herb for treating various diseases, such as syphilis, coughing up blood, and inflammation. Wood can also be used as a cup to drink a mixture of health and body warmers. Research conducted at the Faculty of Pharmacy, University of Gadjah Mada University, Yogyakarta, reveals that the cup has a capacity of antioxidant, anticancer, accelerate blood circulation, and relieve breathing. Finally, a sugar cube as a complement to provide a sweet taste, without discarding the original sense of smell as well as the ingredients are. How to make it easy uwuh wedang only. All material is brewed with boiling water or boil if you want to make the size of the lot. Various materials in wedang it if it has been fused and boiled the roots produce a reddish-brown beverage is formed from the dominant color of a cup. Aroma wafted the scent of cinnamon. A sense of warm, spicy, sweet, derived from ginger and other spices. Curious to enjoy a dish of wedang uwuh? You can create your own. The ingredients were not hard to come by. Almost every stall in traditional herbal ingredients to sell these materials. Most of the material, such as cinnamon, ginger, wooden cup, sugar cube, and cloves are also available in supermarkets. Or if you been to Imogiri, do not forget to buy the ingredients oleholeh wedang uwuh already packed full. Price per pack is relatively cheap.